← What’s good on Netflix Instant? The MFJ-1700C Antenna / Transceiver switch. Position ‘A’ at front right connects to the HT-37 tx / HQ-170 rx vintage station. The black coax in position ‘5’ is the lead-in to the Gap Titan DX vertical antenna. Note the ‘COM’ port that joins selected rig and antenna. An antenna switch is a must have item for any ham who has more than one antenna. 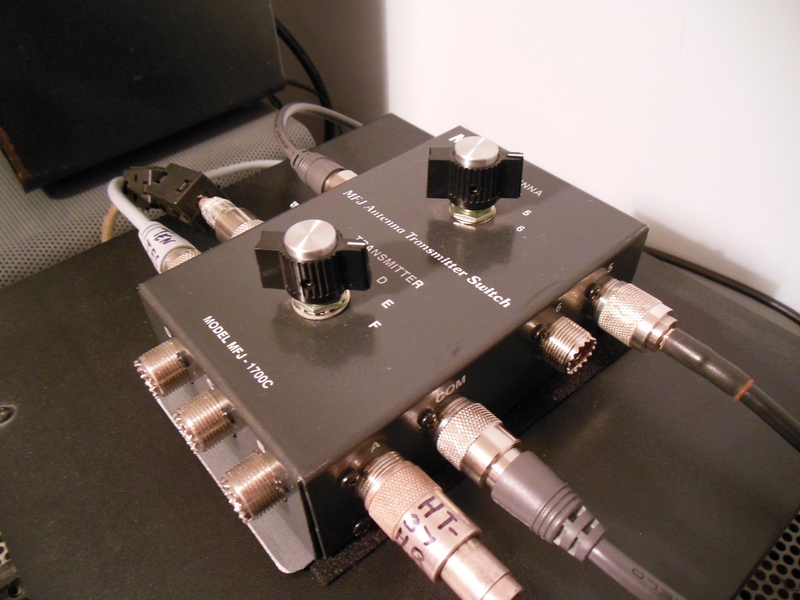 A really great antenna switch is a must have for a ham who has more than one transceiver. I needed a ‘really great’ antenna switch and I found one. A little background, first. My old antenna switch was a 1:3 switch. You either attached one transceiver to up to three antennas or one antenna to up to three transceivers. It just depended on how you turned it around. This worked OK until the day I decided to transmit with one transceiver while having another one connected and turned on. My old Swan Cygnet (tube unit) no longer hears so well on 10 and 15 meters. Oh well, I learned. I also threw the switch out eventually when it failed. So much for cheap ($25) antenna switches. Then I saw the MFJ-1700C. This unit looked too good to be true. It allows the operator to hook as many as 6 antennas and 6 transceivers simultaneously. 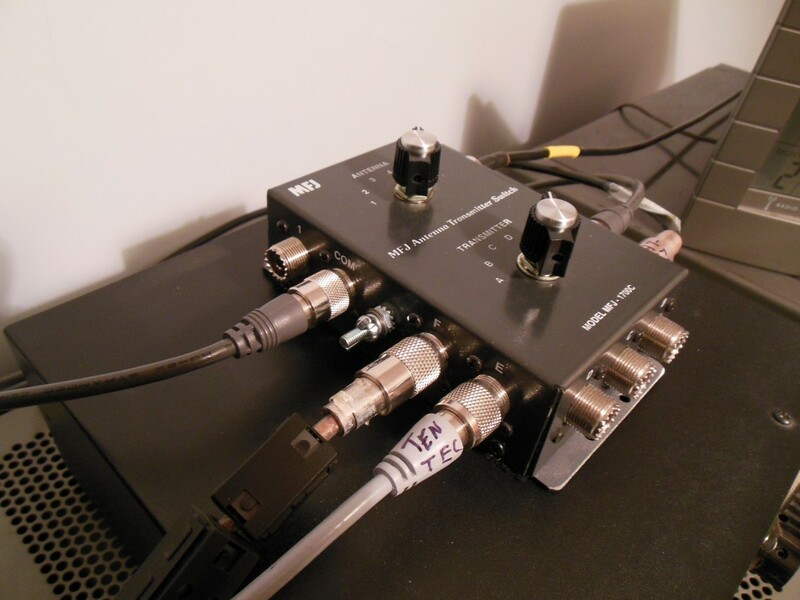 You can simply dial in any antenna/rig combination you want. Of course it is still unwise (stupid) to have two rigs turned on at the same time. Otherwise this switch answered all of my requirements. This view clearly shows the rotary switches, ground post, and the various SO-239 connections. I label the coax (see Ten-Tec at port ‘E’) so I can quickly and accurately dial in the current operating position. It comes with two rotary switches, one for antenna selection (positions 1-6) and one for rig selection (A-F). Just dial in the current operating setup and you are ready to transmit. You will also find on each side of the switch a connector labeled “COM”. You must either run a jumper between the two COM positions or attach them both to an accessory such as a SWR or power meter. The one meter can then be used for all of your transceivers. I elected to just run a jumper between them. The MFJ-1700C retails for $99.95 (in latest print ads anyways; the MFJ website says $119.95) and is worth every penny. I purchased mine on Ebay from a private seller (estate sale, never used) for a nice discount. If you look around you may also find them discounted. The switch has worked without a problem for over a year now. I love it! This entry was posted in Occasional Commentary, Radio: Amateur & Broadcast and tagged antenna, gap, mfj, MFJ-1700C, quality, review, switch, titan, transceiver. Bookmark the permalink. Very nice article. Thanks Ken. Thanks, Lee. If you decide to get back into regular ham activity, this is a nice unit. I like MFJ equipment and refuse to join the crowd that enjoys making fun of it. They are priced way below competitors and are quality designs. Any problems I have ever experienced have been minor stuff that I was able to correct. Pat; You just connect the antenna connection on the FT920 to one of the ‘TRANSMITTER’ ports on the switch and set the ‘ANTENNA’ switch on the 1700C to the port that has a connected antenna. The two COM ports must be connected by a jumper coax cable. Your internal ATU, when selected at the rig, will now be inline between the 920 and the antenna. It works the same as if you had no switch. The switch just allows you to select which rig is paired with which antenna. The COM ports must be connected to each other by either a single jumper cable or two cables with a meter or tuner in between. Placing a tuner across the COM’s would allow you to use an external tuner with a rig that does not have an ATU such as the FT101E. You could leave that tuner in place when using the 920 ATU but would have to select the BYPASS switch on the external tuner. If all you plan to run is the 920 you just connect the two COM ports with a jumper. Where would I put a amplifier? I have 3 rigs to one ant. I use com for ant. I want to put amp on one radio. Do I place the amp on radio side after radio or the com port before the ant. Thanks Bill VE3UC. (1) The transceiver antenna connection is connected to the amplifier RF-in coax connection. There is also a transmit switch connected by an RCA cable going from the transmitter to the amplifier (not shown in drawing). (2) The amplifier coax-out cable goes to a separate SWR meter. I put the meter in there because it can measure up to 2,000 watts and can thus handle my amplifier (AL-811H, max 600 watts). (4) The two common connections on the 1700 are attached to each other with a coax jumper. (5) My two antennas are attached to ports 5 (Gap vertical) and 6 (off center fed dipole). By selecting either port 5 or 6 I can use either of the two antennas with the same transceiver. I can use the amplifier or bypass it by using the Standby switch (STBY) on the amp. 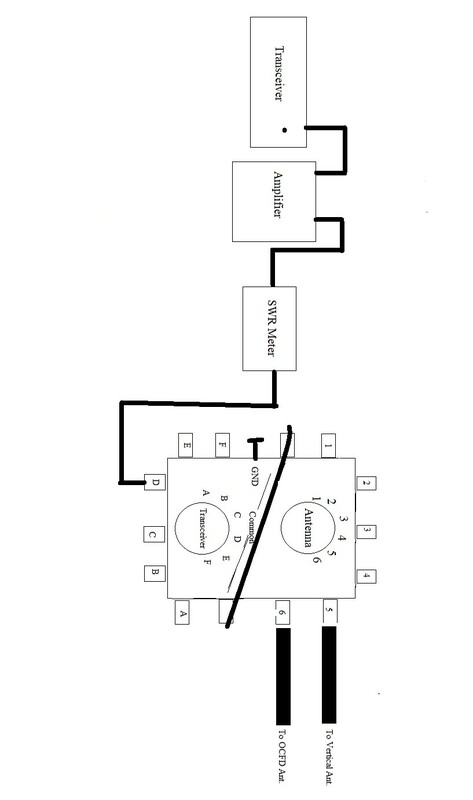 I only showed and described a setup for one transceiver in the description above and in the diagram. In actuality I have 3 transceivers and one vintage station (separate transmitter and receiver) connected. I left all that out to make it simpler. The way I have things attached only one transceiver is able to key up the amplifier but any radio can use either of the two antennas. In my actual setup I have an antenna tuner attached to port 6, not the OCFD antenna. I attached the OCFD antenna to the output of the tuner. If I select bypass on the tuner it is the same as if had connected the OCFD directly to port 6. I also have a dummy load connected to another antenna port. This allows me to properly tune the radio before I pass the signal to the tuner. and then the OCFD. The Gap vertical does not require tuning so it is not in the tuner circuit. So, the diagram I attached works for me. You should get the same results if you do it the same way. Note that I jumped the two COM ports with each other. I believe you did not do that. Also I suspect I could have put the SWR meter between the two COM ports and it would work the same. I did not do that because of physical restraints (I would not be able to see the meter). I hope this helps rather than makes things more confusing!